Welcome to this week’s blog post! Today I am sharing my trip to see the Pavilion by Danish Architecture firm BIG. 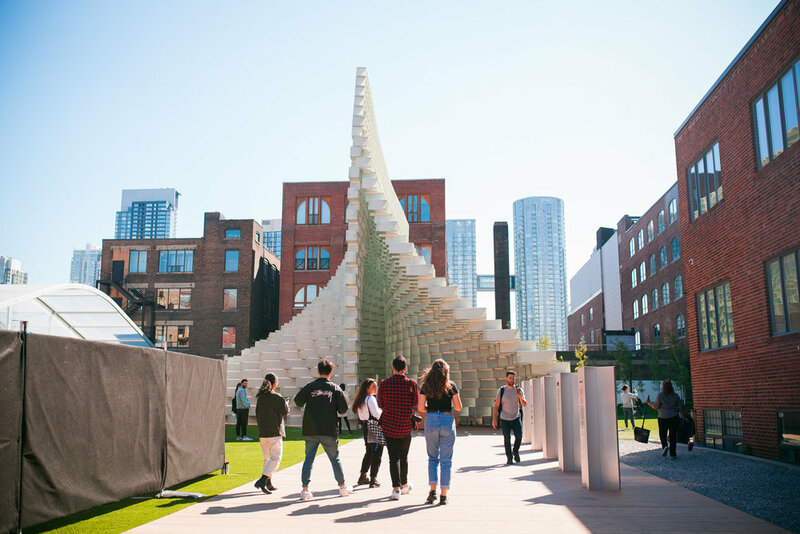 The story behind the structure is that it was first designed for and unveiled at the Serpentine Pavilion in London, England back in 2016. 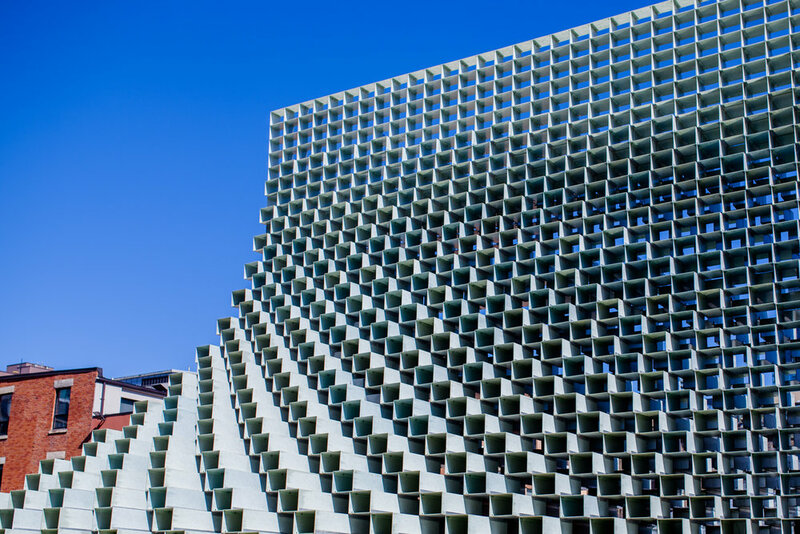 According to Azure magazine the Unzipped pavilion is about twenty-seven meters long and is assembled with 1802 hollow square fibreglass frames that are stacked upon each other with the form tapering upwards to a point to create a zipper like look to the structure. When we were there it seemed to be a big hit, with a constant/ steady stream of visitors coming onto the site on a Friday Morning. The thing that struck me about the pavilion was that once I approached it, I could see beyond the structure all the way till the end. Inside, the place embraces you but also invites you to keep moving forward and not stay put in one place. Once through the structure visitors are met with a large area of grass whereby they can sit down and admire the structure from outside. It was a great place to chat with friends about their experience viewing the pavilion and and just have a good time. Housed in the pavilion are displays of 10 of BIG’s projects showcased through models, renderings and recordings. This included a model of the planned 480 suite condominium building in the spot the pavilion is located on in the King Street West area. Here I am in the inside of the pavilion! A view of the CN tower and the pavilion side by side. The undulating for of the structure is mesmerizing. After the exhibit to Kupfert and Kim for lunch we headed to which is a plant based and gluten free restaurant located at the corner of Richmond and Spadina. It was busy in the restaurant with it being lunch hour. The food was delicious. One of the dishes we had was the burger plate which had a vegan patty on bed of brown rice topped with pico de gallo, guacamole & pickled onions, served with roasted yam and a side salad. Yum! Well that is the end of this blog post. 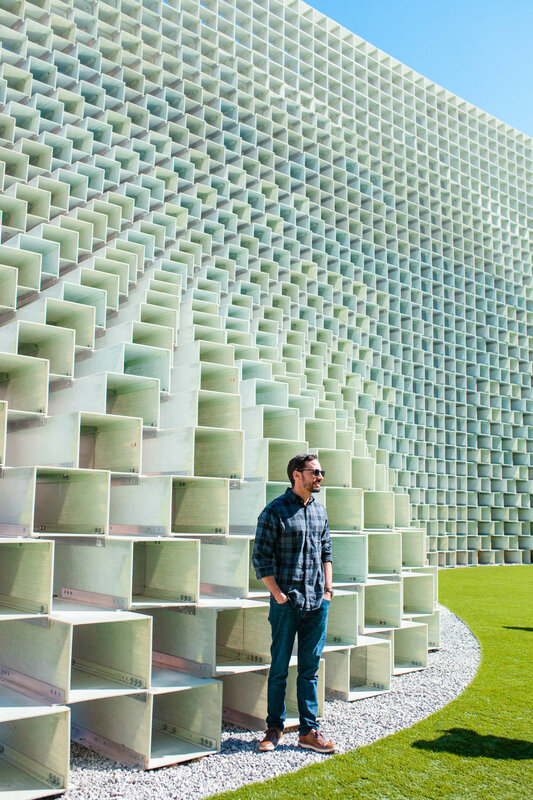 Thank you for joining me as I explored the new Unzipped pavilion by BIG. I hope you will also get a chance to check it out soon. As always peace, love and light!